The Formula Management Add-in for Excel is designed to facilitate the managing of all formulas within Excel. It can be used to map a spreadsheet by formula type. The add-in also allows formatting the background color of all formulas that match a set criterion. It a can also format the font of all formulas that match any criteria. Once applied, it can be ascertained a glance which cells contain formulas and which do not. When a spreadsheet contains formulas, it may be necessary to ensure that no user can delete, over-write or modify them. Formula Management for Excel can do this in seconds by specifying which formula types to Lock, Hide or Lock and Hide. The sheet can also be protected in the same step. All cells can be easily Locked or Unlocked in one click. The Formula Report Generator allows the creation of a report showing formulas within the Workbook that are either external references, internal references or both. Worksheet(s) can also be nominated to base the report on. The report that is generated contains, the formula as in the cell, the address of the cell and the sheet is resides on. Auto filter is also automatically applied for ease of reading. 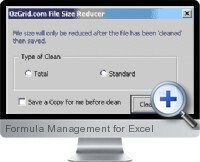 The Formula Management Add-in for Excel comes with a free Excel file size reducer.